Maria Montessori was born on August 31, 1870 in Chiaravalle, Italy. 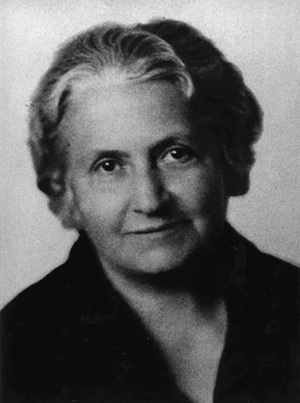 She was the daughter of Alessandro Montessori and Renilde Stoppani. She defied social norms and continued with secondary education in technical school. At the end of her time in technical school she became interested in medicine and went on to medic al school in 1892. She overcame many challenges in medical school - including being the only woman in the college of medicine - and she eventually won over her professors and classmates, gaining much respect. She graduated top of her class with specialties in surgery and in the diseases of women and children. In her later years, she developed her theories on child development and worked in the Casa dei Bambini. The Casa dei Bambini, translated as "The Children's House," opened in 1907. Montessori began by introducing methods and sensorial materials she developed in the past. What Montessori learned at the Casa dei Bambini formed the basis of what we call the "Montessori Method." She was successful because she had a different attitude towards teaching. She found that a teacher should inspire and guide a child. She observed the children so she could understand the child's needs and be able to guide a child in the appropriate direction. She also believed that movement was essential for a child's development. The Casa dei Bambini was without typical classroom furniture. Montessori discovered that by adapting the surroundings - letting the children work on the floor or use child-sized furniture - the children were more relaxed and ready to learn. Montessori believed that when children were in the ages of birth – 6, especially birth – 3, they had a heightened absorbency of information. They are capable of taking in vast amounts of information and their environment through their senses. They easily take in language, develop motor and cognitive skills naturally, and copy social skills. The Montessori approach is based upon a sincere respect for the child as a developing person with an absorbent mind, self-motivating curiosity, and desire to learn and master skills. The child is given freedom to choose among constructive alternatives in a carefully prepared and stimulated environment. The child develops self-discipline through concentration and the example of mutual respect provided in the classroom.